"This is one of the best chocolate mousses I've ever tried. It's so creamy (o.k. probably extremely fattening but holiday calories never count, do they? )I personally make the mousse without any alcohol added. 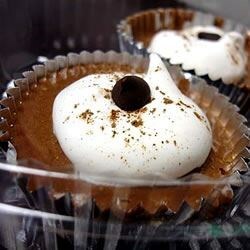 Garnish with whipped cream and chocolate shavings for an extra special effect." Place chocolate in a metal bowl over a pan of simmering water. Stir occasionally until mostly melted, then remove from heat, and stir until smooth. Set aside to cool slightly. In a separate bowl, whip heavy cream to medium stiff peaks, but do not allow it to become grainy. Set aside. In a separate bowl, whip egg whites with salt until soft peaks form. Sprinkle in the sugar, and continue whipping to medium stiff peaks. Fold in egg yolks and kirshwasser. Fold in the melted chocolate until completely incorporated, then fold in whipped cream until evenly blended. Spoon into dessert cups, and chill until firm, about 1 hour. This is a great recipe as long as you make it right. If the cream and eggs aren't whipped exactly how it specifies, weird things may happen.